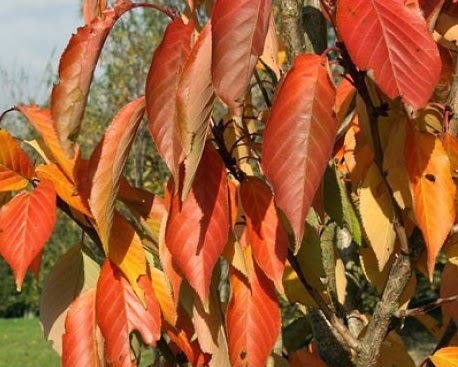 Prunus 'Kanzan' is one of the most popular of all ornamental flowering cherries, yet despite being one of the most commonly planted of all garden trees its origins are somewhat obscured. We know that it is a member of the Japanese 'Sato Zakura' group of cherries and the general consensus it that it is a cultivated variety of the Prunus serrulata forma purpurascens. Also known by the cultivar name 'Sekiyama', it is a strong growing, medium-sized, deciduous tree with characteristic stiffly ascending branches which become more spreading as the plant matures. 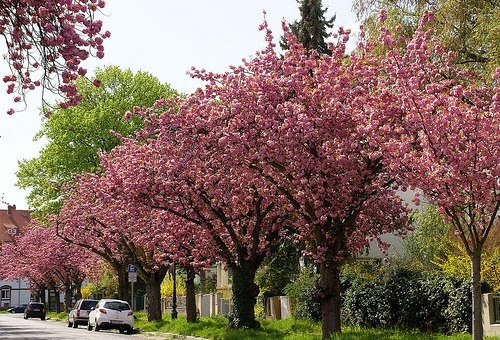 Depending upon condition you can expect Prunus 'Kanzan' to grow to a height of between 8-12 meters tall and 6-8 meters wide. It is noted for both its autumn colour and outstanding floral display. The double flowers are large and showy appearing in mid to late April, usually before the leaf buds break. The blooms open from crimson buds and turn to a purple-pink colour once fully formed. They are between 3-5 cm wide and usually last no more than a couple of weeks. The young leaves emerge a gorgeous copper-red or reddish-brown and turn to a dark-green as they fully open. The leaves are ovate, with a serrated edge and approximately 12 cm long. Come the autumn they provide an attractive display turning yellow to orange-bronze before leaf-drop. 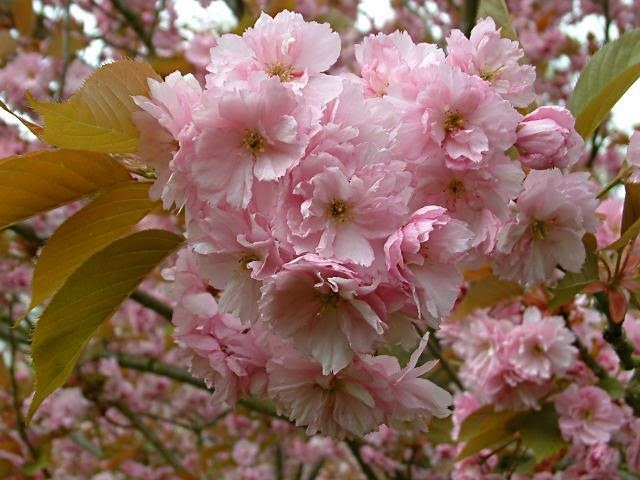 Prunus 'Kanzan' will perform best grown in a moist, fertile, well-drained soil in a sunny position. However it is known to tolerate semi-shade. Avoid soils that dry out during the summer or become waterlogged after periods of heavy rain. On exposed or winter sites it will need the support of a sturdy stake until the root system becomes established. Depending on the risk, rabbit or deer guards may need to be put in place at the base of the trunk. Prunus 'Kanzan' was introduced to European gardens in around 1913 and received its Award of merit from the Royal Horticultural Society (RHS) in 1921. It went on to receive further awards from the RHS including the First Class Certificate (FCC) in 1937 and the Award of Garden Merit (AGM) in 1984. Prunus 'Kanzan is sometimes wrongly grown in cultivation under the name of 'Hisakura' however this particular cultivar expresses a taller in habit and comes into bloom approximately one week later.